Depending on where you live in the United States, you might have a different name for a sweet, carbonated beverage. Live on the west coast or in the northeast? It’s soda. The midwest? That’s pop. Parts of the south? Coke (even if it’s Sprite). But how about what Americans used to call fizzy sugar water? With our friends at the Dictionary of American Regional English (DARE), we bring you eight old-timey names for a soft drink. This old-fashioned name was used especially in Maine. A 1925 quote in DARE says that “even today in the remote northern part of Maine, carbonated beverages are referred to as ‘soft beer.’” According to the American Heritage Dictionary, small beer refers to weak or inferior beer, and, by extension, unimportant, trivial things. To think small beer of is to think lowly of someone or something, says the Oxford English Dictionary. This old-timey term might have been used especially in North Carolina. Also sodey dope, sody dope, or just dope, a southern colloquialism for a soft drink. While some of us might equate tonic with tonic water, a quinine-flavored carbonated drink, in New England, it refers to a carbonated soft drink in general. This vintage phrase was chiefly used in the South, especially North Carolina. Also bottle drink. If you happen to be in the Lower Mississippi Valley and someone offers you a cold drink, you can expect a non-alcoholic, carbonated, bottled beverage that won’t necessarily be cold, at least according to one quote in DARE. “I need a drink!” some of us might say when we crave a cocktail. But in the southern region, such a term refers to a booze-free, bubbly beverage. To some of us soda water might refer to “a solution of water, sodium bicarbonate, and acid,” but to some, especially in Texas and the Lower Mississippi Valley, it refers to carbonated water that’s been sweetened and flavored. What do you call a carbonated soft drink? Tell us in the comments! This entry was posted in food and drink, language. Bookmark the permalink. My wife (born 1943 in North Carolina) grew up with coke as the generic term. This includes not only non-Coca-Cola, but non-cola drinks as well. I love to learn about the origin and progression of words as well as the variations of slang synonyms that are used in certain regions. These wonderful variations give us writers a vast plethora of choices that can be used in stories, poems and speeches to communicate the precise feel that we want with our words. The numerous synonyms also help to give options in rhyming context so that one can derive the chosen meaning of the sentence through the usage of different ending sounds of the words rhyming. I had never heard the term “soft beer” before reading this article, however this knowledge now brings sense to why we have a soda named root beer, which maintains the same ending of beer even though it is clearly not made of hops and barley. 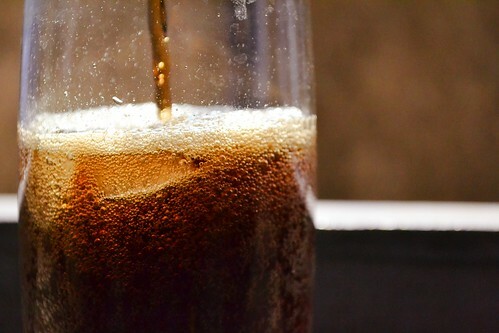 Root beer is a perfect breakdown of what the product is because it was originally made from the root of the sassafras plant mixed with carbonated water (beer). One of the common terms that you seemed to have missed on your blog is simply “pop” which was shortened from “soda pop”. I always here my friends from the Midwest and the North East call all type of soda “pop”. I was born and raised in California and so the word “pop” always seemed funny to me so every time I hear the word used I usually playfully bust their chops a bit just to bring further attention to the difference of the verbiage in the area.